The schedule said that maintenance would last 4 a.m. – 12 p.m. – well, during the whole Legion it’s more generous to the players. I tried to login at 9 a.m. – and succeeded. For a small hour before going to work Micromantica has succeeded in finishing the entrance scenario, opening all the three flight points and exploring the location. Upon doing that, I am 450/6000 Friendly with Legionfall faction. This is a very short and easy list to do. As I understand, the class mounts will be given to you independently. It has nothing to do with flight achievement, although I presume that campaign quests will grant you nice chunks of reputation. To get a class mount, you will need to complete the plot campaign which, like Suramar one, will be stretched over 11 weeks. So think of manasaber here which is a reward for completing the Suramar campaign. Although, unlike manasaber, the order hall mounts are unique and so you are encouraged to complete them for every class. It starts much like Broken Shore assault, then ends up with teleporting to and destroying flagship, and Dalaran breaches the gate of Tomb of Sargeras with arcane cannon. It’s pretty flashy, but I wish there were more links to the Legion launch scenario. I liked how nameless different class champions are your fighting force here. They prove to be really effective, and you feel like you’re just one of them which is cool. They are very capable of destroying demons even without your help: it’s not your average eternal clash of good and bad mobs who would fight forever if you don’t join the fight. You are offered a small clash with Mephistroph as a final scenario boss: quest says “kill”, but you barely take 10k off his hitpoints, and he flees for no reason. We know he’s the new dungeon final boss, but his presence here was useless in the first place. He fought like a girl, he ran for it – I think we’d better get rid of some other demon captain, and kill him properly with some effort. I didn’t do any world quests here yet, I was hurrying to explore. All in all it reminds much of a Isle of Thunder. The same bleak, dark colors, the same mage base. I like it more than not. They also threw in some new demons – because felguards, imps and doomguards grew a bit old. Basically you’re fighting Felsoul Hold deck plus some fresh ones – and they also added fel nagas too. Logistics are a mess. I’ve found two checkpoints which have something to do with my artifact weapon quest, and I couldn’t reach the third although it was within my hand’s reach – but on a cliff. Didn’t have too much time to fight all the way back there, so it’ll be left for the evening. I’ve opened both flight points though. Of course my 12th alt would get to every point with her eyes closed: it’s just a question of experience. And yet I hate the slopes so much. Can’t wait to fly. I need to see the WQs of course, but my first run showed that we lack some variety here. It’s demons, demons and demons. There’s no pinch of salt detected – remember how we had this saurok area at the Isle of Thunder? Nethershards are plenty. I didn’t engage in a fight or quest yet, just occasional mobs on the way, and I got 375 shards. Tier tokens are your 400 shards, so you could buy them easily. New garrison resources come as quest rewards only. If you happen to be Exalted with previous Legion factions, you are encouraged to grind them again. Every 10k reputation over Exalted would grant you a chance to loot faction-specific mount from the chest: that means a total of six extra mounts. I hate the random incorporated in this. Surely it’s the perfect motivation to keep WQs relevant, but imagine a dude who diligently grinds every emissary chest throughout the expansion and never gets it. I’d say the drop chance here should be at least 25-30%. It’s a big work with six factions, and it has no guarantees, so please make it less tedious. I’ve checked out the tier sets and was surprised to have only FOUR collected. What about Naxxramas I was grinding and running multiple times for achievements? What about Molten Core – hello, I’m Exalted with Hydraxian Waterlords? What about Firelands? What about Pandaria – I was collecting the sets on PURPOSE there? 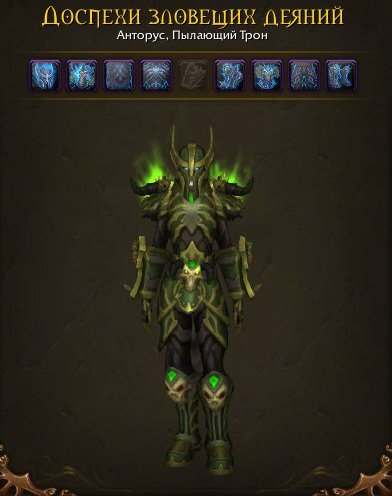 I don’t know if I could get PvP sets without PvP, but I’ll run the older raids for sure. This is a FUN and relaxing activity to me, and now it has a purpose. All in all the Patch 7.2. is a new breath of air. It’s a plot advance, and it’s new opportunities for your gameplay. I don’t hate it, it looks nice and it’s new lore, but I’m growing tired of demons. And we also have Argus patch coming. Like I said, my first priority will be Micromantica’s dailies in Broken Shore: I need that Revered reputation asap. The other toons would lazily complete emissaries and follow her steps if they have time. It’s the first weekend of my routined, relaxed gameplay. Let’s see. Yeah: routines! I’ve picked up the pace. The important thing is not to try and do the emissary for every toon. The important thing is not to get tired or exhaust yourself. The important thing is to do only emissaries, not every quest available. The important thing is to pick a toon you want to play at the moment. You wait for raid, you run emissary quests. You have half an hour, you run emissary quests. It’s easy and enjoyable. Just don’t think of them as of obligatory things. You’re not in a hurry, you’ll be there Exalted. My chart has color codes for reputation numbers: orange for friendly, green for honored, blue for revered. And my chart is very quickly becoming blue nowadays. Yes, it’s on farm. People are still struggling with Gul’dan – which requires several wipes – but all in all the rest of the raid is completed pretty smoothly. The full runs are very exhausting, and the real reasons for this are Botanist and Elisande. Their encounters are easy, i don’t even remember a single wipe, and player deaths are very very rare. It’s just they are ridiculously long and tiresome. After Athenaeum wing I don’t even feel like doing anything else and need a break. I hope we have at least two or three months for this raid – it would be nice to get 7.2. not earlier than May. I’m constantly feeling whipped by Blizzard to run and run during this expansion – like a horse at an obstacle race. I don’t have any time for extra activities. Yes, I have many alts, but my time’s got to be compensated with not running any freaking dungeons which other people do. I’m not happy with patch delivering speed this time. I don’t get the overall madness with shinies. The player obsession with them seems like… religious. Legendary this, legendary that, let’s run a thousand mythics a week to get them! And you barely could wear 2 by now. I’m not excited with them – at all. You can’t wear many. You can’t collect all, and it’s useless if you did – you can’t wear everything. It doesn’t even alter you ilvl for more than 1-2 points. And they are not really suited for all specs – which means you should wear a heap of replaceable items. It’s partly justified with tank – heal – dps roles, but when my warlock gets a shiny where she doesn’t benefit in two other specs? And the whole random thing – these shinies don’t even feel earned. All of my toons have one or two. Most of them came either from emissary chests, some off LFRs. But do I care about shinies? Not a tiny bit I don’t. We are powerful in the field and smash the mobs, we provide decent contribution in LFR. I guess shinies in their current state are more of an annoyance than profit. I’m not excited about them, and if tomorrow they would suddenly be replaced by current LFR items – I would just shrug and say “OK”. Melaris the Demon Hunter is farming Lunarfall mine and herb garden daily to level her professions. 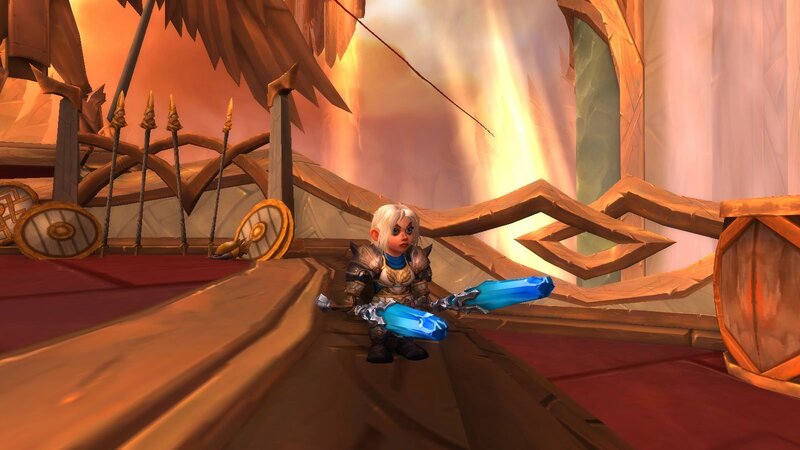 Suddenly she decided to make her Garrison cosy. And she ordered a construction! Bons has discovered cool options for Fury Warriors I’ve never thought of. You could have some real fun when dual-wielding – and fighting – with staves and spears! 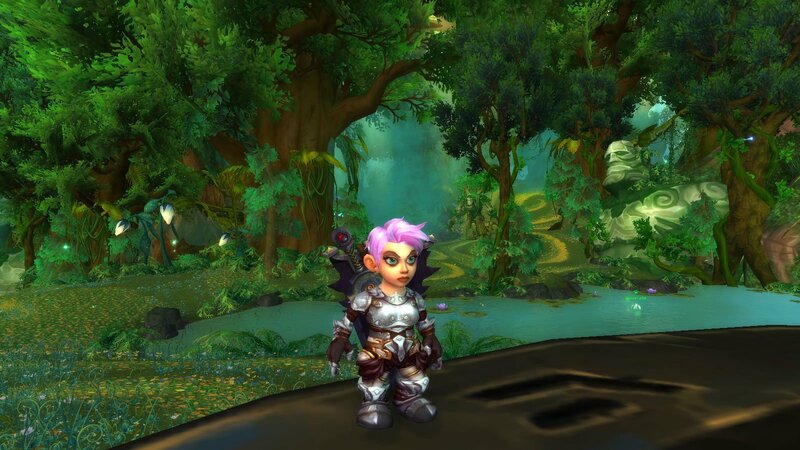 This World Quest week has really boosted my toons. Now when I caught some breath, the aftermath is huge. Almost all have 5 followers at 850, ready to cope with all the threats. It means that I also find them often on hold, waiting for Artifact Power missions to pop- which doesn’t happen every day. My toons’ Artifact Knowledge range is between 11 and 18. Well, you can’t actually do anything about it, just fuel the research and wait. It will take at least month to make it from 18 to the final 25 – it’s 5 day research at the current stage. 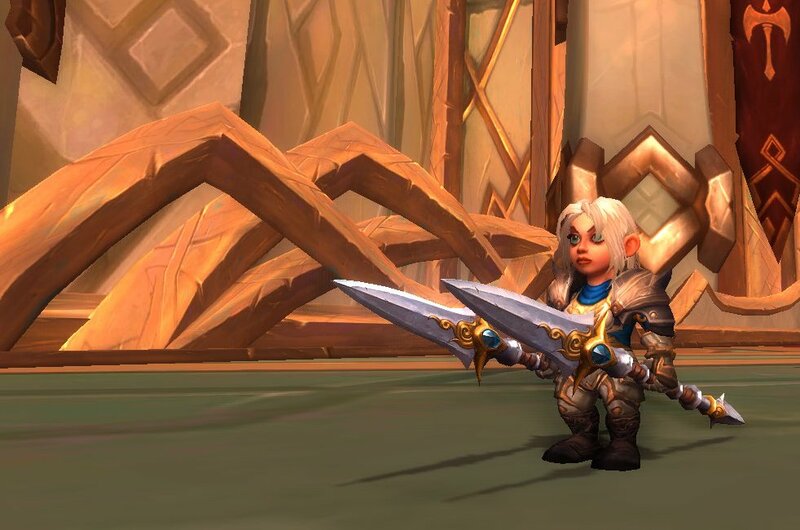 All of my toons have at least 19 artifact weapon traits, the highest score being 29. Finally, almost every toon is now ready for running LFRs. 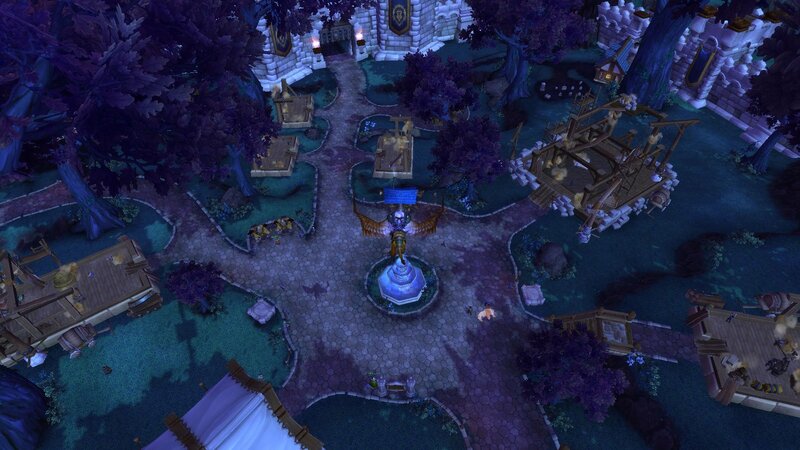 I think I’m gonna be back on Pandaria/Draenor-style tracks: LFR becoming a focus of gameplay. Take the toon you feel like playing tonight, go queue with it, simple. What’s awesome, is that you have world quests and Suramar to do while waiting for raids. As I told previously, with all the rewards I just don’t see raids as a gear-up source. 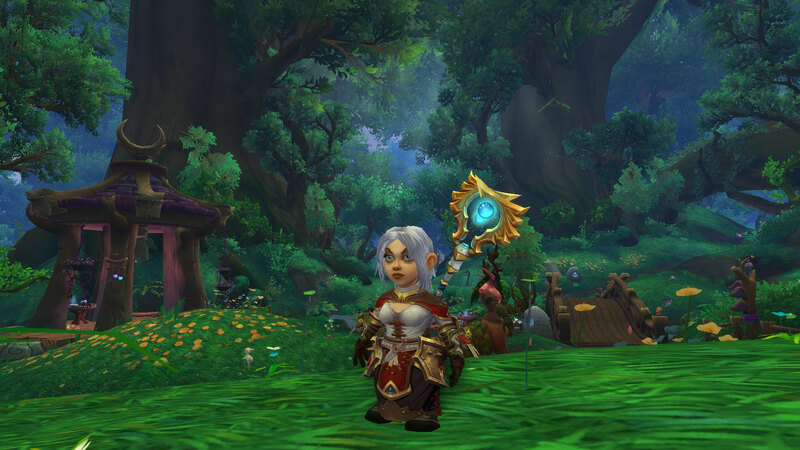 Chests from emissaries and world quests themselves are much more rewarding for less effort – even if we talk about LFR! But I want to fill my mogging collection, so I run raids, and ilvl would come as a bonus. Trials of Valor system is exactly what I’ve been talking about previously. 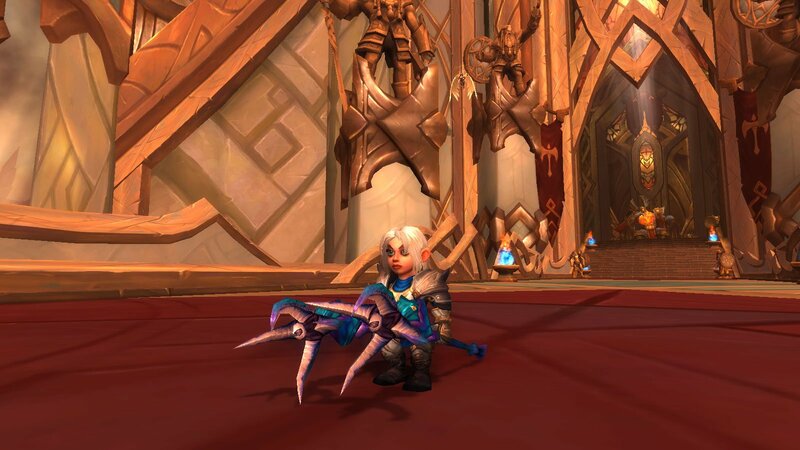 You need to run few cooldowns of the raid, and you get a full set of mogging gear – it’s guaranteed. That’s an excellent system, and I wish it would be developed. 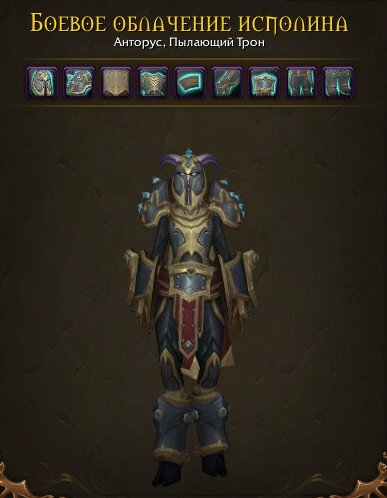 You work to get your mogging, and it’s not a random drop, but you could get your gear somewhere else if you don’t feel like raiding. 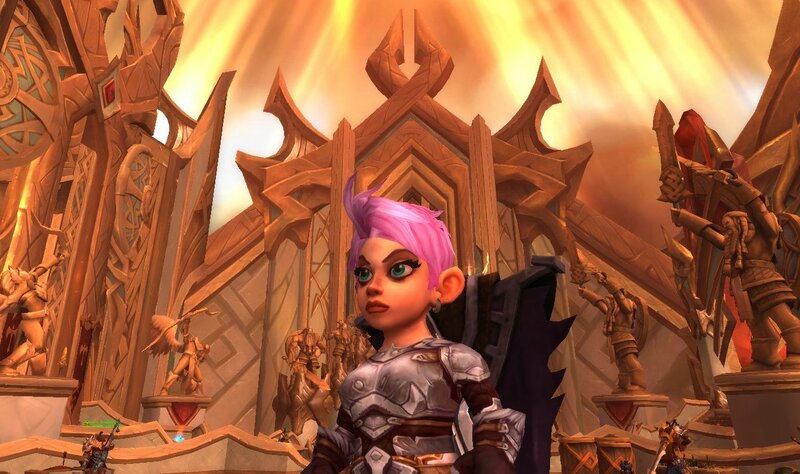 Speaking of gear: I’ve performed world boss kills for every toon and for three weeks in a row. Gear drop rate by my stats is exactly 25%: I got 3 items for 12 toons every week. Naturally the whole week has been a never-ending bouncing around world quests. Just to remind you: the weekly quest grants you 5000 order hall resources for completing 20 world quests per alt. You also gain +50% reputation for single world quests, so it’s a small but nice buff too. Not to mention the usual emissary reward – which often grants +800 order hall resources as well. In other words, upon completing the event you just stop worrying for order hall resources for at least a month. Your result upon completing the event would be 7000-10000 stack which is quite enough to fuel your artifact research and level up/gear up your necessary 5 followers – if you haven’t done it yet. Go for short quests.Your average world quest should take 3 minutes tops. Generally the kill-me-twelve is not good, you also need to avoid any gathering in highly populated hostile areas. Normally you go for these types: Kill an elite enemy, Fill the bar (several options beyond grinding, and killing a single mob grants 5-10% at once), Pick a single resource (kill a demon), Do any small fun activity (wand mastery in Azsuna, squirrels in Val’sharah, hunting the hunters in Highmountain etc. ), Give in a profession quest if you can craft it and have mats. Go for quest batches. You may want to visit an area where you could do 2-4 quests within walking distance. But highest priority are short quests. If one of the closer ones involves grinding, drop it. Emissary quests are nice if you could do at least three easily. If current emissary quests include two short and easy, and the other two require a dungeon run or grinding at faraway map corners, drop it. Don’t try and do them all in one sit per alt. You may want to complete the same easy quests with huge rewards alt by alt, and wait for another day for the new cool ones to pop. Waiting is bliss. I’m very close to an end now here, having completed a total of 214/240 quests by now. With the guidelines I provided before, it was a pleasurable and fun journey. Raising ilvl – an important side-goal. Almost all toons (11/12) can do heroic dungeons now, half has an access to Emerald Nightmare, three are qualified for Trial of Valor. Professions – once you roll up the sleeves, it’s actually not that impossible. Blasted through 30 levels with enchanting and tailoring, now at 780 skill level, could do more, but mats were over. Won The Shortest Distance achievement – gained from completing 20 puzzles off an Enginnering toy. It was hell! You really need to be an engineer to complete that :) But not impossible once you’ve learnt what to do. An achievement well earned, and it will be one of my most precious ones. 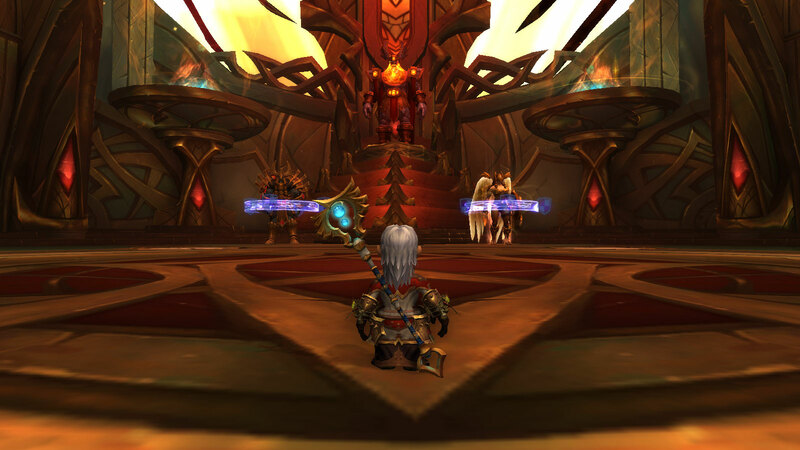 Trial of Valor raid – need to complete a small lead-in quest chain for every alt to be ready for the raid and go there upon reaching the right ilvl. 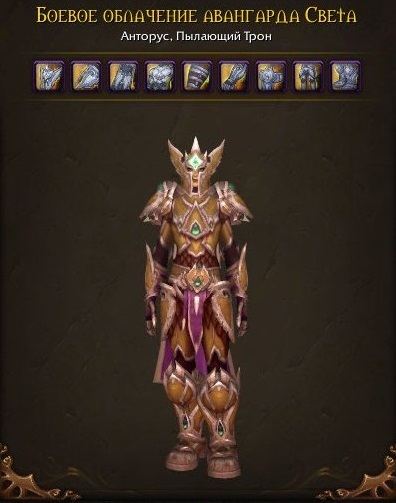 I need these transmogs, they are actually pretty awesome for all armor types. It was an easy kill, but I must say that I don’t like the EN raid neither as a tank nor as a dps. The encounters are quite understandable, but all in all are a mess. I’d prefer not to run this raid if I have an option. Will do it mostly for transmog – and for this reason, I see necks, rings and trinkets drop as a waste. Micromantica, my main, has accidentally completed her first ever mythic dungeon yesterday – Catacombs of Suramar. The goal was to see the dungeon and complete a pair of quests. 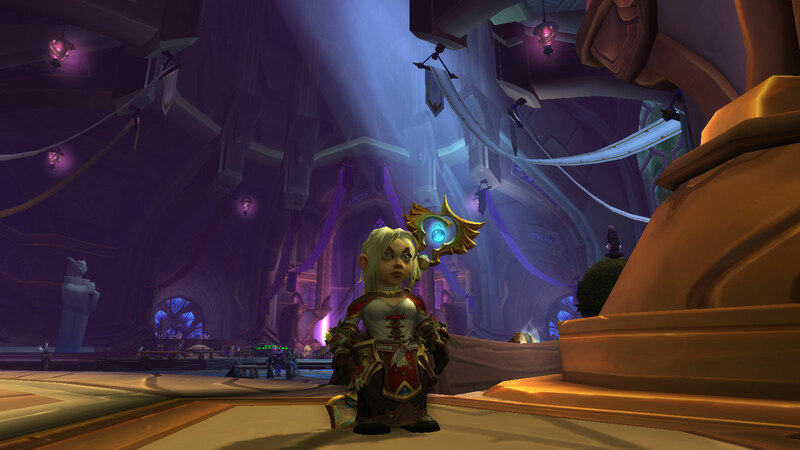 I got there occasionally as my guildies wanted to do some mythics – they always yell in a chat. The only reason I don’t want to do mythics is that I have absolutely no desire or need to go there. Why, an exhausting, few hours version of the same dungeon that I will run hundreds of times during the expansion? No, thanks. Suramar is a bit different, as it’s mythic-only. Still a shame it’s not in group finder yet for being the only difficulty. The run was punctuated with many deaths, but we actually managed to push through to the end and even do a world quest there. The main stopper was that three of the guildies in group were actually healers, and two of them had to switch specs into some poor, non-powered dps. Moreover, we failed to complete several vital mechanics on bosses on our first tries, and we wiped and died. But still, we were positive and persistent. Once you know how the bosses work and experienced the mechanics on your own skin, the dungeon is actually a piece of cake. There was a mess with Kirin Tor quests this week. The quests were very hard, and there were not enough. People kept sharing that you must have an excellent internet connection to complete them, it all sounded like a very grindy arcade game. So I didn’t even go there and try it myself – I was on a big, short-quest run, remember? And I hate the arcades too in my MMO. Well, suddenly this morning you could just login on every alt and give in the emissary Kirin Tor quest on every alt even if you haven’t completed a single Kirin Tor world quest. A nice excuse from Blizzard for their failing Kirin Tor emissary quests I guess, but not that earned by me :) Be warned, it’s not a bug – it’s confirmed by Blizzard, so please go and get your unexpected rewards. This very busy week comes to an end, and I’ll be back to my small routines on Wednesday. Having fun so far! What about you?